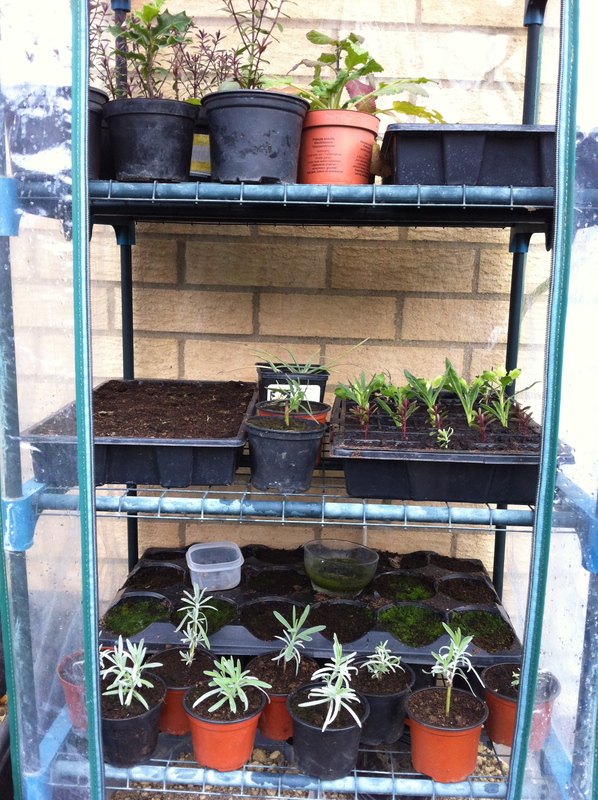 I have mentioned that I have a greenhouse of sorts every so often in these posts but haven’t said much about it. It isn’t a large, grand Victorian affair, it isn’t even a standard glass and metal job, it doesn’t even have any glass. Instead, it’s a free standing (if you weigh down the bottom) plastic greenhouse with four wire-rack shelves and a zip-up front. I bought it around spring last year. That single purchase alone has saved me loads of money because I can now confidently raise plants from seed, take cuttings and keep them all protected. I can even use it in the middle of summer to germinate mango stones and bake the lemon (while it still fits inside). Never having had a greenhouse before, it took a little while for me to get used to it. There were several mishaps such as when the whole thing blew over in high wind as I hadn’t weighed the bottom down and when I forgot to unzip and open up the greenhouse in the morning and it turned out to be a hot sunny day and everything inside cooked while I was at work. Despite this, I persevered and am much more experienced with it now. It has let me sow and propagate many plants and I’ve saved so much money creating my garden this way rather than splashing out at the Garden Centre. I couldn’t live without it now and it’s in constant use. It takes more effort and care to grow plants from seeds and cuttings but it’s addictive and it’s much more satisfying and there’s never enough space to propagate all the plants I want. Top: Hebe cuttings (a few months old now) and a small holly pretending. Salvia and a seed tray of Arum Italicum “marmoratum” (Lords and Ladies). Middle: Another seed tray of Arums and a cutting tray of more hebe with purple and yellow osteospermum. There’s also a dianthus at the back. Bottom: Seed tray of iris seeds (not hopeful) from my aunt’s garden. The pale Tupperware has stratifying Tilia Petiolaris (scented weeping silver lime tree) seeds and in the foreground are lavender cuttings that have been potted on. Floor: two tubs (used to contain fat balls) of rock – it’s not going to blow over again. The green house is so handy, it extends the warm season by keeping the frost out as best it can and giving shelter from the winter cold and winds. It’s south facing and next to the house and the large set of patio doors. The heat loss though these helps keep frost away too. I’m amazed at just how much warmer than outside the greenhouse can be in the winter and that makes for (relatively) snug young plants and a great summer border.